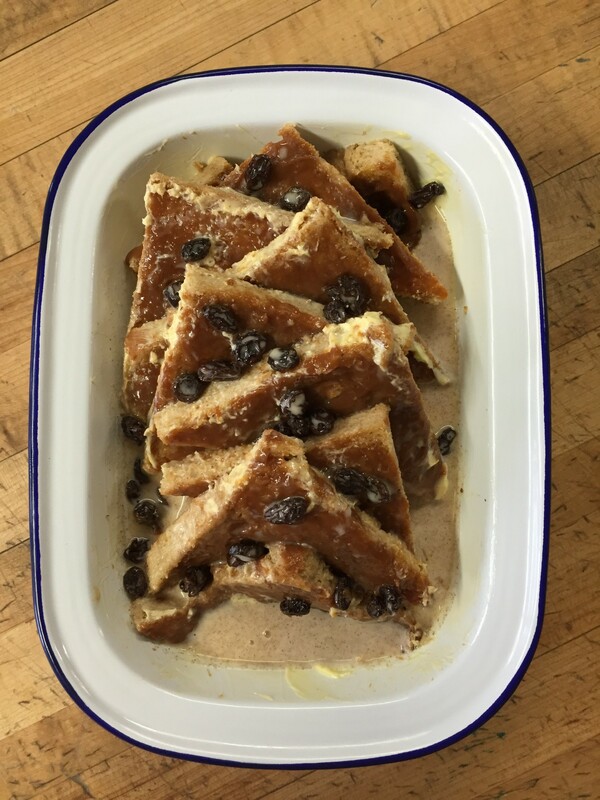 Try this simple yet delicious bread and butter pudding using our Clairesquares Caramel. A no-fuss dessert that’s quick to pull together with or without freshly whipped cream on a wintry evening. 2) In a large bowl, make the custard: whisk eggs, cream, sugar, cinnamon, nutmeg, salt and vanilla extract. Set aside. 3) Melt caramel and butter in a separate bowl. 4) Spread each sliced bread with the caramel butter sauce. Cut slices in half diagonally and overlap half of them in the bottom of a baking dish. Sprinkle half of the raisins over the bread. Repeat with remaining bread and raisins. Pour custard over the bread and let soak for 30 minutes. 5) Place baking dish in a large baking pan. Add enough hot water to come halfway up the sides of the dish. Bake for 20 minutes or until the pudding is set and the top is golden. Remove baking dish from the water and allow to cool on a wire rack. 6) Serve warm with caramel infused whipped cream or custard. Bread and Butter Pudding (pre-bake). 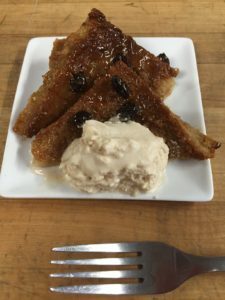 This entry was posted in Blog and tagged bread pudding, caramel, recipes. We believe in the importance of shopping locally. We are always looking for new retail outlets. If you would like to suggest a retail outlet near you, please contact us: info@clairesquares.com or call us at 510-207-2847. Please check individual stores for stock. Clairesquares – Artisan handcrafted Irish sweet treats © 2017. All Rights Reserved.